I've used RSS feeds to keep up with the blogs and other websites I wanted to read for a long time. I used to use NetNewsWire, which was (and still is) a great bit of software, but when Google Reader came out, I switched to that. I liked the quick keyboard shortcuts to navigate around, and the fact that using an online reader meant that I could read feeds on any browser and not have to deal with items that I'd already read elsewhere. However, recently I've been finding that I'm overwhelmed with information, particularly if I've been too busy to check Google Reader for a few days. I subscribe to a few high volume feeds for the occasional useful item that they throw up, but that means an awful lot of stuff I'm not interested in to wade through. That's why I was intrigued by Fever, a new feed reader by Shaun Inman, who also designed the lovely web site analytics program, Mint. There must be hundreds of feed readers out there, but Fever distinguishes itself in two ways. First it is a self-hosted service, meaning that you have to install it on a web host. This would be a problem for those without a web host, but it does mean that it is available on any computer you choose to access it from and also under your direct control, unlike Google Reader. Second, it offers a way to pick out interesting items from your feed, without overwhelming you with information. To do this, you assign your high volume, high noise feeds to a special 'Sparks' group. Any items that share links or topics in common with your other 'Kindling' feeds will promote those topics to the 'Hot' list. 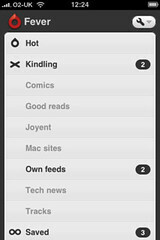 This shows you feeds grouped by topics, so you can skim them or read the individual feeds as you wish. It's a great way to keep up with the things everyone is talking about, without being submerged by your unread feeds count. Other people's Delicious feeds are perfect for Sparks, and you can add feeds to the group with impunity knowing that it's going to make your Hot list more interesting, rather than bogging you down. It's always a bit of a gamble paying for something ($30 in this case) without being able to try it out, but the screencast was reassuring and showed most of the fetaures. 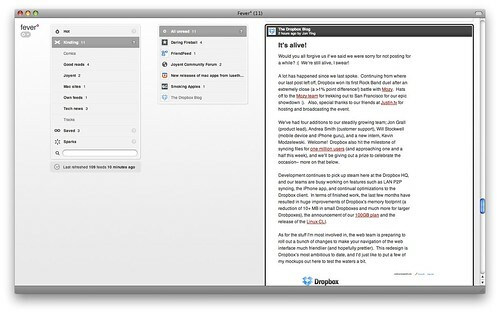 It's really easy to install (unusual for a self-hosted service) and importing my feeds and groups from Google Reader was quick and accurate. The UI, as you can see in the screenshot above, is very clean and rather pretty. There are Google Reader-like keyboard shortcuts for most things, and it's easy to move around the feeds. There's also quite a lot of customisability at the level of groups or individual feeds, and by default, feeds with no unread items are hidden, making it easy to see what you've got. Shawn Blanc has some good tips for using Fever efficiently, and he's right that it works very nicely as a standalone Fluid app. But it's also good as a tab in Safari, particularly if you use this tip to make Safari open links with the target="_blank" attribute in a new tab, not a new window. Fever also has a truly lovely iPhone interface — one of the best I've seen — for reading feeds on the iPhone. Of course, because it's getting data directly from your Fever installation on the server, there's no syncing issue, but that also means no offline reading, which iPhone apps like Byline offer, and which can be useful at times. If you have long articles to scroll through, the interface on the iPhone can be a little bit longwinded, so a few more navigational aids would be a benefit, I think, but other than that, it's really slick. Fever is only at Version 1.0, but is already a very competent and useful web application, which distinguishes itself well from the competition. The only thing I really miss from Google Reader is some way to share articles I come across. It would be nice to have a command to post items to popular services like Delicious or Twitter, or to share items publicly. I'd also love a command to save an article to Instapaper, particularly on the iPhone, where you'd like to save long articles to read at your leisure. Alternatively, if there was an API available of some kind, people could find ways to pipe their saved articles to other services. I'm sure that these kinds of improvements will come with time. Shaun has done a great job, and it's obvious that he's thought quite deeply about what a good feed reader needs.